This is my very first short-guide in what hopefully will become a successful series of guides. Marki's short-guide workshop and leave a comment in the thread. This guide was technically not sugested by anyone, but I made it because of Skipxdan's post Jungle Arachne any help appreciated. On this guide I spent about two hours on the guide itself (build and all the other information about Arachne) and about two more hours to establish a decent layout that I will use moving forward with my other guides in the series. She one of the best early game gods in the game. Which means that she is strongest early in the game and your goal will be to dominate the early game so hard that your team can close the game mid/late game. She is one of the best gods for fighting 1v1 in the game, and in the early game there is no one that can deal with her (especially at level 1). She also excels at invading buffs and counter jungling. So make use of this to counter the enemy jungle and make him as far behind as you can. She is pretty squishy, so you need to build some defense to be able to get into fights. This will be the focus for your build moving into midgame so that you are able to stay relevant in teamfights. Bad at teamfighting, unless you build as a bruiser. 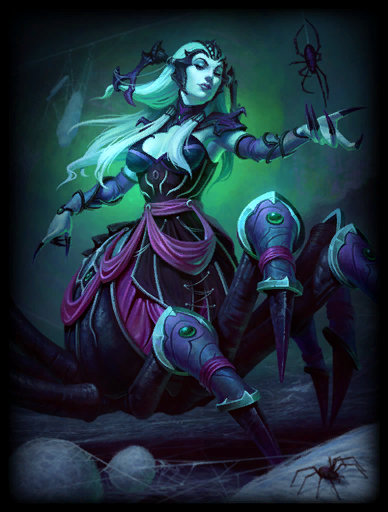 There is definitely a lot more items that could be viable for Arachne than what I am going to discuss below. But these are the items I personally would reccomend to someone who are relatively new to the game or god. They will give you a good balance of power and survivability. Your starter items will be focused towards giving you a lot of sustain and making you a beast 1v1. Because jungle. It gives you more sustain, faster clear and more gold. Always take this when you play jungle. Great for AA-based 1v1 fighters. It gives you a good amount of damage and sustain. You also can't make good use of Bluestone Pendant. In the early game your focus should be on getting as much DPS as possible to dominate the early/mid game. Great early damage and movement speed. If you gank a lot I would reccomend trying out Talaria Boots for the exstra movement speed and the gold proc. In the late game you will switch this out with Ninja Tabi. it can be very effective. It is a bit expensive though and it needs more AS to really shine. Switching it out with either Stone Cutting Sword or The Executioner are both viable options. In the mid game you should shift your focus to getting some defense to set you up for teamfight in the mid/late game. If your team is dominating you should focus more on damage before moving into defense. This is just an insane item. Above 50% health it gives you an insane damage boost and bellow 50% it gives you a ton of defense which can let you escape without using Night Crawler or at leas let you use it later than you normally would have to use it to get out. The problem is that you want more attack speed after just finishinv Qin's Sais so if the game is still consisting of mostly 1v1 skirmishes and no grouped up teamfights picking up The Executioner at this point will be beneficial. You can also considder switching this out with Frostbound Hammer if the Web isn't enough for you to keep up with your targets. This is just a great defensive item. You need to get this now to stack it up before the game goes into the lategame. This can also be switched out with matle of discord, but it is expensive and the cooldown reduction isn't super relevant for Arachne. But Mantle of Discord is technically better, the biggest upside is that you do not need to stack it so you can build it later. But you want a cheap build, so this is more of a luxury item if you are fed. You can also switch this out for Winged Blade if you struggle against slows ( Poseidon for example), the movement speed is also great for keeping up with your targets. By now you should have enough defense to survive long enough to be relevant in teamfights, so your focus is going to shift back to DPS again. And mainly making Qin's Sais as effective as possible. This will give you some much needed penetration (ideally you will buy this as your third item) and it will improve the effectiveness of Qin's Sais by a lot due to the penetration and AS. This gives you more MS to chase your targets and the protection shred is perfect with The Executionerand Qin's Sais. If there is a lot of teamfights and you are dying to fast to be relevant at all in the fights going Masamune instead can give you the defense you need to stay alive and get stuff done. will count for a lot less than the extra procs from Qin's Sais, The Executioner and Stone Cutting Sword that Ninja Tabi will provide you with. I have already mentioned the situational items above, but I'll go over them again just because situational items are very important and knowing when a situational item is needed is what makes you transfer from being decent at a god into being great at a god. These boots are great for farming, the proc is easy to get with your Web and the movement speed is great for ganking and just rotating all over the map. You lose out on some power, but Qin's Sais is your main damage source. So it does not effect you that much. I love this item, but if you don't like it Warrior Tabi is fine. This is perfect for teamfighting, it gives you the protections needed to dive the backline and still survive. It has a good amount of damage as well and the movement speed is just great. It is cheap, you get some survivability with the CC reduction and the health. But you mainly pick it up for the slow immunity and movement speed to keep up with your target or get out of stuff like Whirlpool. This is the definition of a luxury item as I mentioned. It has a good defense spike and the passive is great for those sticky situations. The cooldown reduction is just a bonus that you don't really need on Arachne. It helps you stay on your target and the health is also going to help you out. The passive also helps you boxing vs gods like Mercury, Kali and all hunters. But unless you are against a physical heavy team I would not recommend going for this. Starting with Web gives you the potential to kill someone at level 1. But starting Venomous Bite is also fine for the extra sustain . Then you will prioritize Venomous Bite -> Web -> Cocoon -> Night Crawler (taking one point into it at lvel 5 ofc.). Try to get a kill in mid at level 1, go in from behind the enemy (at the mid entrance close to the enemy tower) use Web on the enemy mid (if he has noe escapes) or the jungler (if the enemy mid has an escape). After that just farm and gank (focus gods without escapes). Also try to invade as much as you can. Keep invading and ganking. Try to not get caught in situations where you are outnumbered. Try and pick off enemies that are out of position. And in teamfights dive the backline as long as you have ult to escape with. Try and sneak in from behind. I would personally swap out the position of Qin's Sais and that of Stone Cutting Sword. Stone Cutting Sword will be more beneficial to you early game as the movement speed helps to close distances between you and your prey much quickly, the high power is nice for increasing the damage of Venomous Bite and also your basic attacks, and the flat armor reduction it gives is really helpful early on since you will be able to deal close to true damage to your opponents. Qin's Sais on the other hand is slightly more expensive and a bit harder to build into as a second item, and also won't be providing you with as much damage as you would hope since 1) Qin's Sais passive works better with more attack speed and penetration you have which Arachne will not have any of at this point and 2) The passive of Qin's Sais won't be dealing as much damage either early on since it scales off a target's maximum health and most of your targets will have low health, resulting in low early damage. Later on into the game, you will get more benefit from Qin's Sais as you will already have more attack speed and penetration into your build and you will get more value from the passive as every god will have more health at this point. 124030 xXDannTheMannXx I would personally swap out the position of [[Qin's Sais]] and that of [[Stone Cutting Sword]]. [[Stone Cutting Sword]] will be more beneficial to you early game as the movement speed helps to close distances between you and your prey much quickly, the high power is nice for increasing the damage of [[Venomous Bite]] and also your basic attacks, and the flat armor reduction it gives is really helpful early on since you will be able to deal close to true damage to your opponents. [[Qin's Sais]] on the other hand is slightly more expensive and a bit harder to build into as a second item, and also won't be providing you with as much damage as you would hope since 1) [[Qin's Sais]] passive works better with more attack speed and penetration you have which [[Arachne]] will not have any of at this point and 2) The passive of [[Qin's Sais]] won't be dealing as much damage either early on since it scales off a target's maximum health and most of your targets will have low health, resulting in low early damage. Later on into the game, you will get more benefit from [[Qin's Sais]] as you will already have more attack speed and penetration into your build and you will get more value from the passive as every god will have more health at this point. That is probably the correct thing to do, but I have not really done much more than play the game since Stone Cutting Sword was put into the game. So I have never taken the time to actually test it properly. Movement speed as you mentioned is Alpha and Omega (that is why I love Talaria Boots). But I have never liked getting a late Qin's Sais, because as you mentioned it is expensive and tier 1 and 2 are useless. So in the early game where Arachne is a powerhouse even without items is in my opinion a good time to get it out of the way. But most of all because even though the proc deals more damage late game and with more attack speed, you are you are going to have a much harder time to actually proc it (unless you manage to catch someone 1v1). This especially goes for Arachne ( Kali, Bakasura can get away with it more easily). I also mentioned that you should think about getting The Executioner as your third item, which will make Qin's Sais a lot better as your second item. But I probably should have made that more clear in the text. But even without The Executioner as your third item you will get enough procs from Qin's Sais due to the Web and Cocoon to make it extremely powerful in the early and mid game. But Stone Cutting Sword might just be better. I will try it out some time. 124045 BestMinionEver Appreciate the feedback! :) That is probably the correct thing to do, but I have not really done much more than play the game since [[Stone Cutting Sword]] was put into the game. So I have never taken the time to actually test it properly. Movement speed as you mentioned is Alpha and Omega (that is why I love [[talaria boots]]). But I have never liked getting a late [[qin's sais]], because as you mentioned it is expensive and tier 1 and 2 are useless. So in the early game where [[Arachne]] is a powerhouse even without items is in my opinion a good time to get it out of the way. But most of all because even though the proc deals more damage late game and with more attack speed, you are you are going to have a much harder time to actually proc it (unless you manage to catch someone 1v1). This especially goes for [[Arachne]] ([[Kali]], [[Bakasura]] can get away with it more easily). I also mentioned that you should think about getting [[the executioner]] as your third item, which will make [[qin's sais]] a lot better as your second item. But I probably should have made that more clear in the text. But even without [[the executioner]] as your third item you will get enough procs from [[qin's sais]] due to the [[web]] and [[cocoon]] to make it extremely powerful in the early and mid game. But [[stone cutting sword]] might just be better. I will try it out some time.